Fire up the candles and let's celebrate! 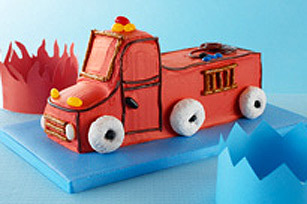 This Fire Truck Birthday Cake is simple to make using a few store-bought ingredients. Your little firefighter will love this cut-up cake recipe. Tint whipped topping with red or yellow food colouring until desired colour is achieved. Spread over entire fire truck. Attach 3 donuts on each side of the truck for "wheels;" add candy to centre of each donut for "hubcap." Use pretzel sticks to create "ladders" on back and sides of truck. Lay licorice on the top of the truck to make a "water hose." Outline windows, doors and hood of truck with remaining licorice. Add assorted candies to top of cab and on front of cake for the "top lights" and "headlights." Store in refrigerator. Whipped topping can be coloured red or yellow, depending on the colour of the fire trucks in your area.